‘Deposed In Dublin’ | Come Here To Me! 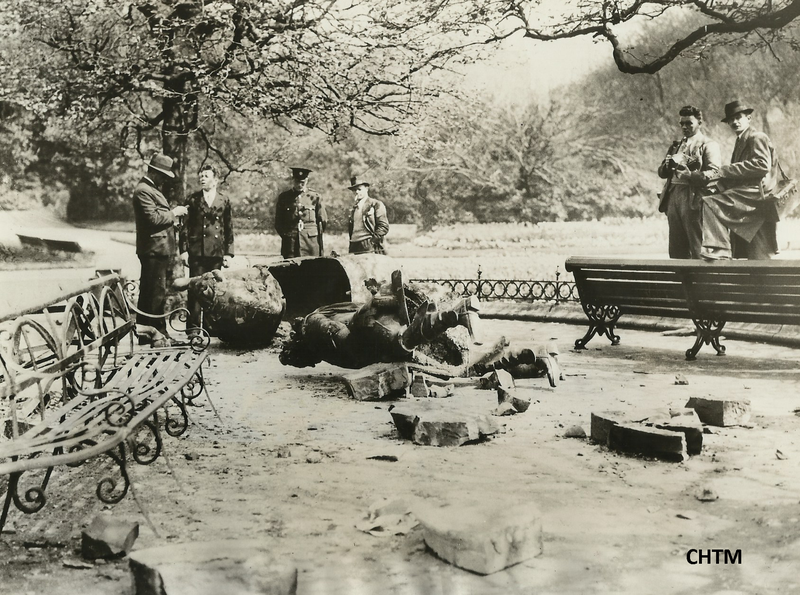 Earlier in the month, we posted a piece looking at the George II monument in St. Stephen’s Green, which was bombed in May 1937. The monument stood in the centre of the Green from 1758 until the eventual destruction of the work, which was not the first bombing carried out against it. Press photograph showing the damage to George II monument. Press description on back of image. Every Saturday morning at 11.30am I do a tour of St. Stephen’s Green park at 11.30am from the Little Museum of Dublin. 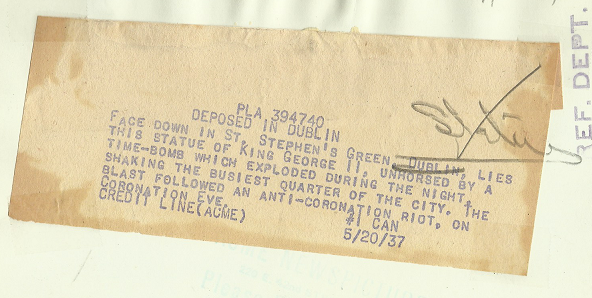 Poor old George II is one of the stories told on this tour. More information available from the Museum website. Are you involved in the running of the Little Museum? I went there just recently on 16th June, for the first time, and absolutely loved it. There is so much variety there, something to appeal to everyone, and the building that houses it is absolutely beautiful. Hi Siobhan! I’m not involved in the running of the place, just the Saturday tours, but they do a great job I agree. Really nice atmosphere to it, I can even look beyond the U2 dimensions 😉 My favourite item in the museum is the letter from Samuel Beckett to the young kid, wonderful.